Our campus language lab is a center for language study, conversation groups, and interaction among those interested in languages. We have computers for individual language study, each equipped with headphones and a microphone. Each computer space is confined within a carrell-style desk, providing you with privacy and focus. 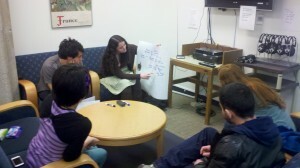 The lab has tables for conversation groups, and small bookshelves for donated dictionaries and other language materials. We hope to see conversation groups form so that learners can practice speaking in the languages they are studying. Individuals wanting to learn a language or maintain proficiency in a language. Academic programs and courses in which language study is required. 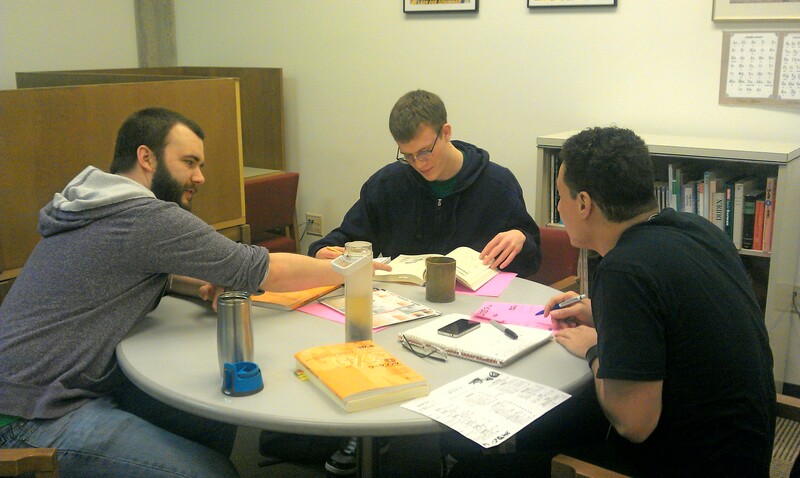 As a lounge for all to gather around to study, network, or converse. Our language lab is a unique vision. Many other colleges have computer labs with language tools, but they lack space for other activities. Evergreen is unique in trying to create community through its academic full-time programs, student extracurricular groups, resident hall activities, etc. This lab contributes to that ideal of community, creating a space where members of the larger Evergreen community can meet to converse in various languages, as well as providing a support center for academic work. We invite you to post comments to our site. We will do our best to incorporate changes that you propose. Your support keeps us funded, and by participating you are helping to make the lab a permanent fixture of the college community.